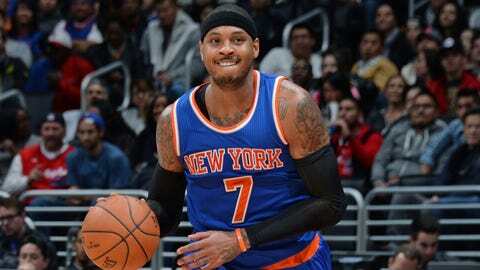 Does Carmelo Anthony kiss his mother with that NYC-denouncing mouth? Carmelo Anthony was merely speaking the truth about New York City. Carmelo Anthony used to be a hero in New York. It wasn’t even that long ago, not even three years, actually. The Knicks won 54 games back in 2012-13, and Melo, who is a native New Yorker, was the hottest thing in town. Anthony, who occasionally responds to negative comments on Instagram, went on to say that he's “immune” to the criticism he gets, but sometimes he wants to “just relax and not have to listen to that s—.” He added, essentially, that you can't win, really, regardless if you react or not. This might sound bad to someone not from New York, but I’m willing to bet 95 percent of New Yorkers, basketball fans or not, agree with Melo on this one. There are tons of days when New Yorkers wake up and don’t want to deal with the rush of the city or the pains of the subway or insane foot traffic on the sidewalks. Sometimes, you wake up, and you’re just like, I’m done. It’s over. I’m moving. Then, five minutes later, you remember that you’re LIVING IN NEW YORK, and you forget ever having thought that. That’s basically what Melo is saying here, except it’s from the celebrity point of view, and I think we can all agree that fans’ opinions on celebrities and New Yorkers’ opinions on their favorite athletes are far from rational. As long as the Knicks win games, no one is going to care that Melo said this, and that alone kind of proves Anthony’s point.